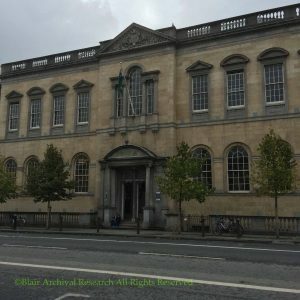 When I was in Dublin visiting family in October 2015 there was of course time set aside for research. 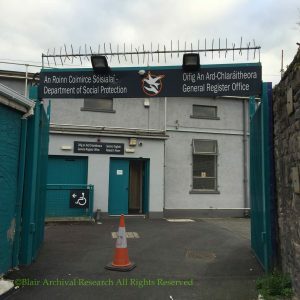 There were six repositories I wanted to visit in Dublin but I wasn’t sure I would get to them all. You can read more about my plan here. The first two posts of my Irish trip here and here. The next repository I visited was the General Register Office. This is where you can pay €20 and search the indexes all day. You can only order five certificates in one day and either come back or arrange to have them mailed on to you. My research plan for the GRO wasn’t very big. I was trying to find out more about a particular branch of my Toomey family as I heard a few of their sons were WWI soldiers and I wanted to know more. This was my chance to get the birth, marriage and death information on this family. 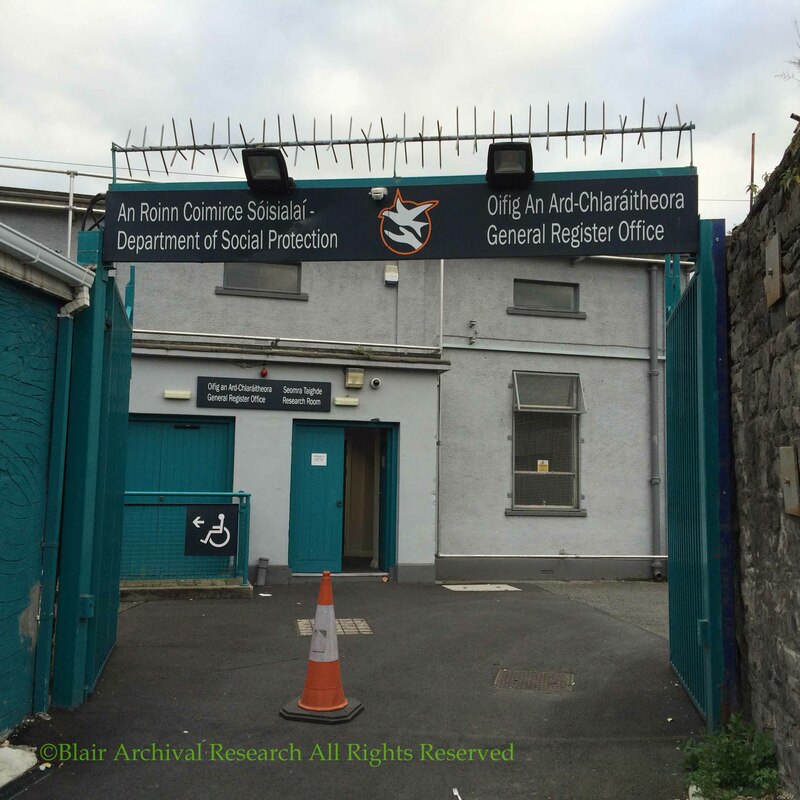 The GRO Research room is tucked away in a nondescript corner of Dublin and it can be hard to find. I walked passed it twice. It was a long walk from St. Stephen’s Green to the GRO but I took a detour through the Castle trying to decide which window my collateral ancestor may have looked out of and then wandered through the Chester Beatty Library on my way past. The GRO is not the prettiest place and the office is very neutral. You have a table and chair and access to the indexes. The people are very friendly and helpful. When you find your entry you fill in an order form and leave it at the enquiry window then wait for your name to be called. Once you receive your document then you pay for it. It is €4 per certificate which is not bad considering how much it costs to get some certificates at home and abroad. I only ordered one certificate that didn’t seem to fit. I then had to revisit the National Archives to check on the wills I ordered and get copies. 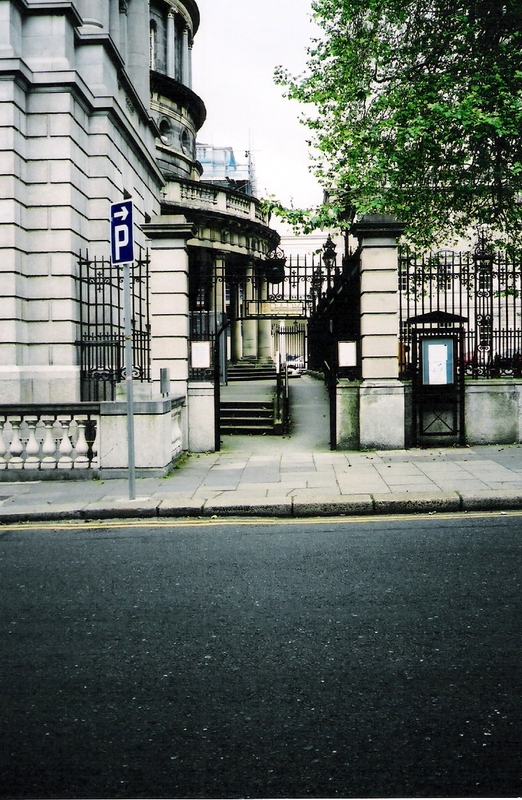 The last repository I visited in Dublin was the Land Valuation Office on Lower Abbey Street. The Land Valuation Office is located in a regular office tower and is rather nondescript. There were some tables and chairs and you went to a main reception area with your question. You chose a chair and they brought the valuation books to you so you could search them. Here I wanted to find out more about the property my Great Grandparent’s owned called Roebuck Lodge which was in Taney Parish in Dundrum. Found out there were two properties in this area called Roebuck Lodge. Another property of interest was the Toppin land in Buffanagh and the Kelly property Calverstown House in Kildare. I wanted to know if they owned it and how long did they own it. This is the first part of the research. The next step will be the Registry of Deeds but that will have to wait for another trip. The one repository I didn’t make it to was the Representative Church Body Library of the Church of Ireland. I was close by but didn’t get in the doors. There were lots of family events and visits to make and that was just as important to me. What was I going to say no to – having coffee with my 102 year old Grand Aunt! Yes I did that and she is as spry and quick as ever. She loves her cappuccino. During my trip I found all these wonderful records and they are still waiting to be transcribed and entered into my family tree. When I got home there were a few lectures that I presented and client work. The next thing you know it is Christmas and things need to be done for that. Next month I am looking forward to sitting down and revisiting these documents and am hoping that I will find some new information in them which will lead me to my next adventure. In October 2015 I had the opportunity to go back to Ireland for a couple of weeks and visit family. Of course you can guess that family history research was also scheduled into this trip. 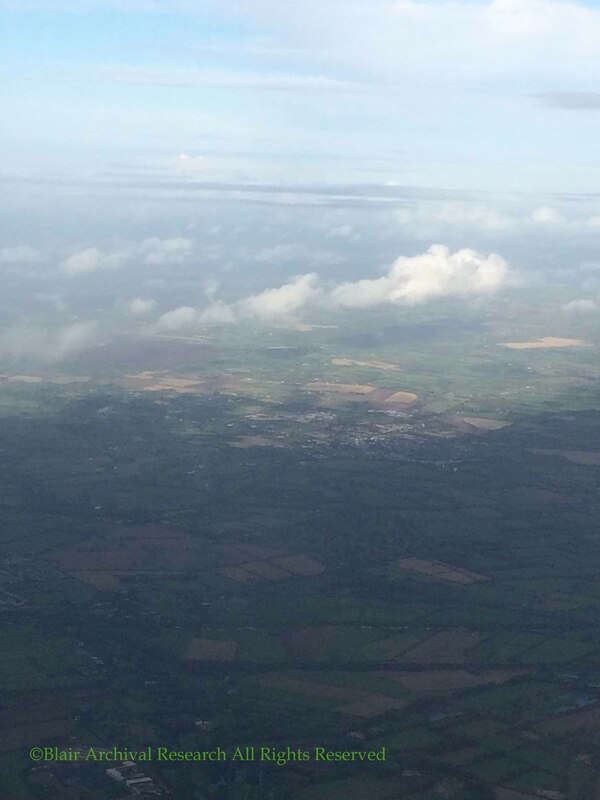 We flew into Dublin and then went straight to Belfast for a few days. We left Toronto at 6pm and arrived in Belfast at 9 am Toronto time the next day. No sleep. After settling things in the hotel I went to the Public Record Office of Northern Ireland (PRONI) to start my research. I had a full research plan and only a couple of days to complete it. You can read more about how I organized my research plan here. That first day I got the readers ticket and started my research. Since I had little to no sleep the night before my reader’s ticket picture looks a little blurry eyed. I was quite surprised how much I was able to get done in the few hours I had at PRONI on that first day. My plan made the process fairly easy. I was only allowed to order five documents at a time. 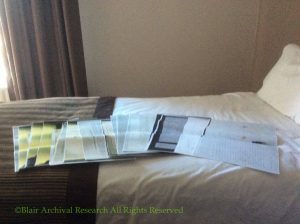 The catalogue entries that were flagged for my research meant that the documents had to be read to make sure they were connected to my family. Once that was done they were handed back with the form for copies. The first day ended when I was having a hard time keeping my eyes open. The next day was a little later start because we had to go and book our train tickets for the trip to Dublin the next day. Then it was off to PRONI while my mother went to visit the Titanic Exhibit. I had three hours at PRONI and was very pleased that I completed my research plan. It turns out one of the documents I ordered had been microfilmed so the copy had to be done from the microfilm. The microfilms that were on my plan were self serve so that eliminated a lot of wait time. When I left PRONI I had a plastic bag filled with copies and a memory stick with some digital images of pages that were so large they didn’t really allow for copying. 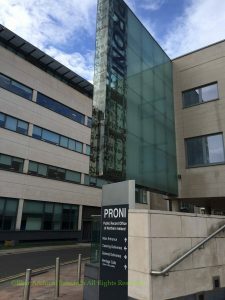 This visit to PRONI allowed me to go back another generation on my Moon family in Dungannon County Tyrone and gather some more information on my Bourne family from Dublin. 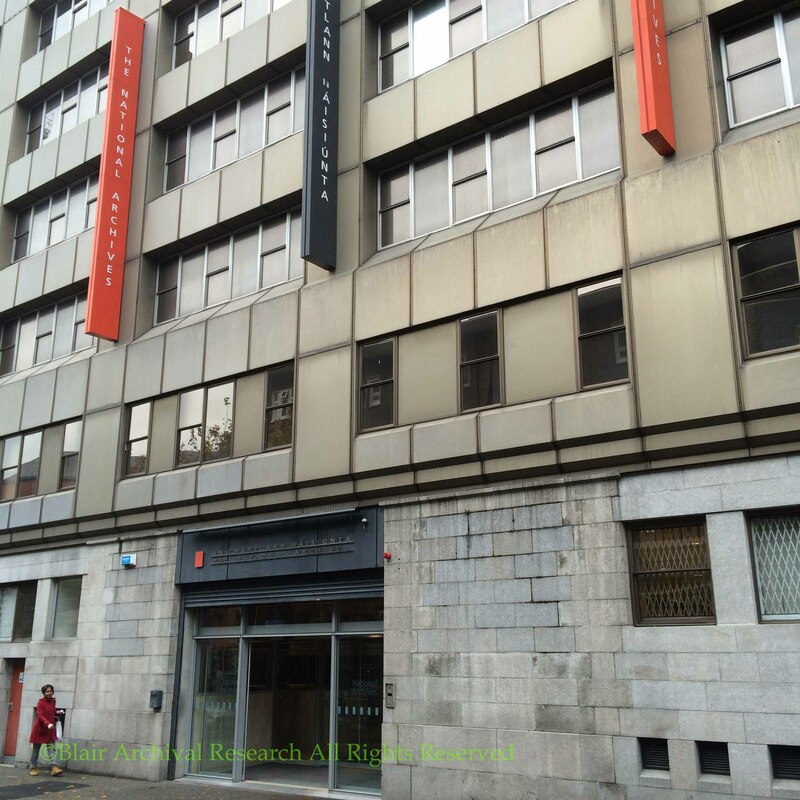 When you do research in Ireland you need to visit repositories in Dublin, Belfast and London. One document I got for my Bourne family must have measured 4 feet by 4 feet. It was written with calligraphy and illuminated letters. 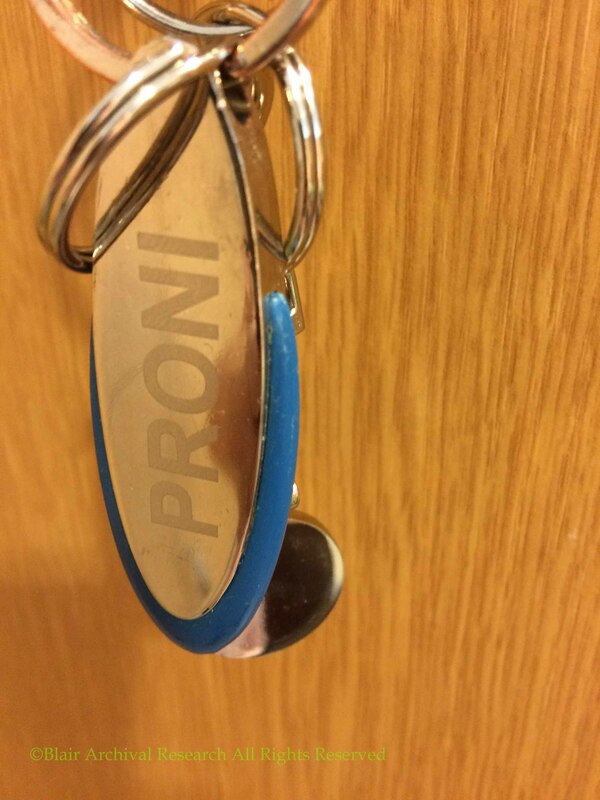 When you arrive at PRONI you have to apply for your reader’s ticket. You will fill in the form, then they take your picture and print off the card. You wear it around your neck while you are in the building. You need it to order documents and enter any of the rooms upstairs. There are security people in each area. The people are so nice and friendly and were extremely helpful. They made the day more enjoyable. You can’t take much upstairs with you and are handed a clear plastic bag to take what items you can take. You must put everything into a locker that you lock with the key. The slug to get the key out is in a holder on the inside of the locker door. The plastic bag came in very handy when I was taking all my copies home. I hadn’t been in Belfast since the 1970s and it has changed a lot. The waterfront is beautiful and on a warm day a nice place to sit and watch the world go by. There are cafes around so you can enjoy a drink and a light meal. We took a taxi to and from PRONI and the service was great. They were well dressed and had the gift of the gab which leaned towards the history of the city so you learned something during your taxi ride. My Mum was saying that the last time she had been in Belfast was when the newly crowned Queen had come for a visit in 1953. 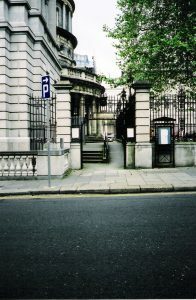 She was attending ceremonies at Belfast City Hall. Mum and her Mum had gone to Belfast to stay with a friend and see the spectacle. She remembers going into a red brick building that had windows where you could sit on the window sills and look right over the City Hall. We were in a taxi on our way to Marks and Spencer and when we stopped it was a red brick building with windows sills that overlooked City Hall. The driver said it was the only one in the area. It brought back lovely memories to her. She told me that my Dad had been a cadet at this event so they were in the same place at the same time four years before they met. I hadn’t heard that story before and it was a great family history moment. 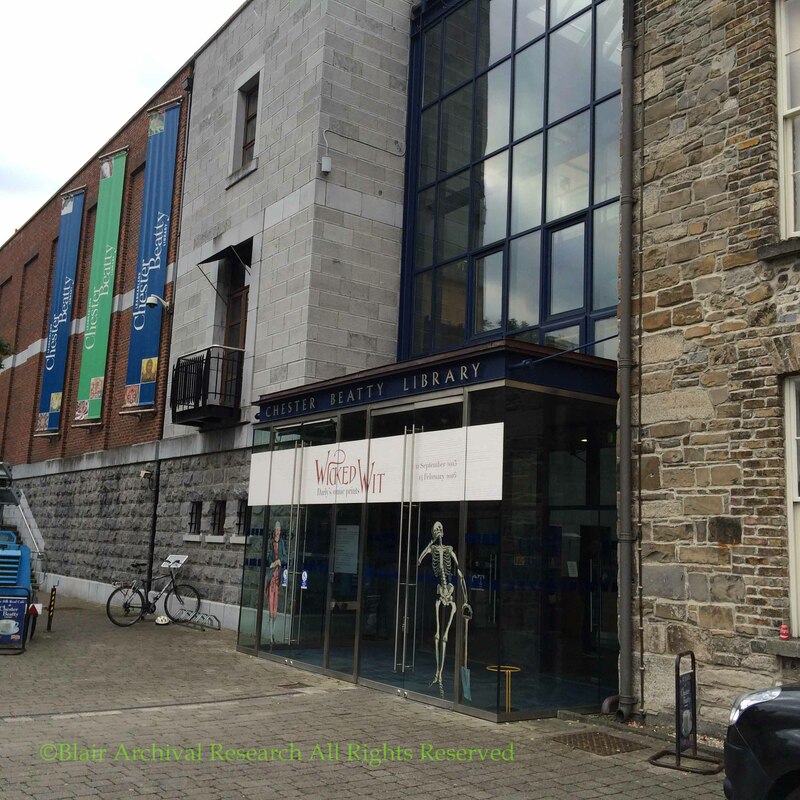 As you know from previous blog posts I am going to Ireland in the Fall and have been busy preparing my research plans for the trip. 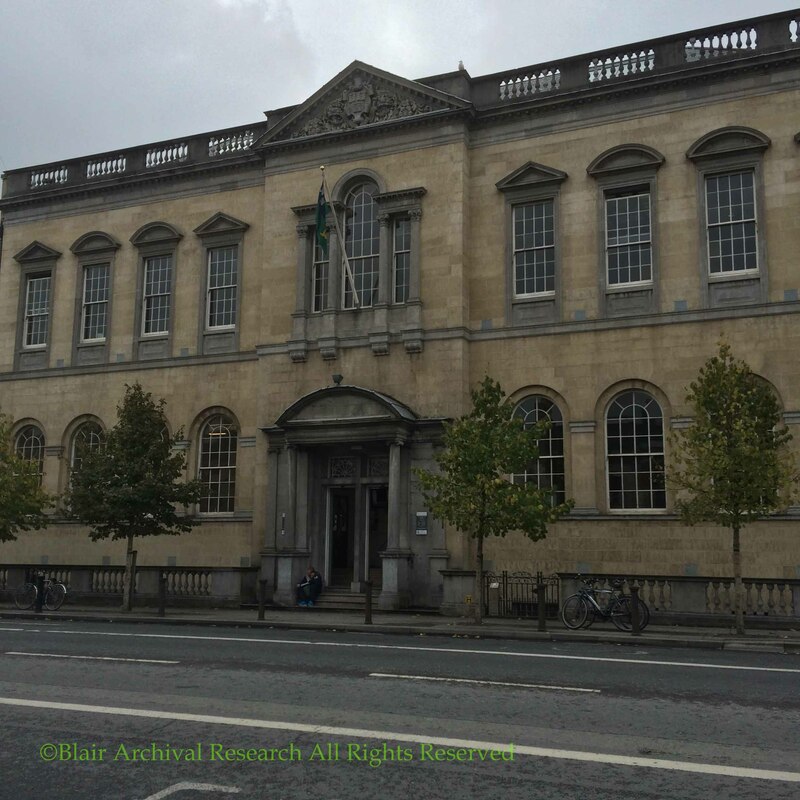 My plans for PRONI are complete and I have just finished the plans for the repositories in Dublin. I have a relatively small list of items to check here. Unfortunately they don’t have a complete online catalogue. It starts about 1980 and is only updated with the new items that are donated to the archives. They do have a long list of wills and testaments but I researched most of those in 2003 but have one or two to check on this visit. There are some parish registers on microfilm that need to be checked. When I go to the Archives I will see what they can suggest for further research. A written synopsis on the person of interest has been prepared. This will help me focus on the subject and will help the archivist/genealogist to understand what I am trying to achieve. They have a free service for researchers. 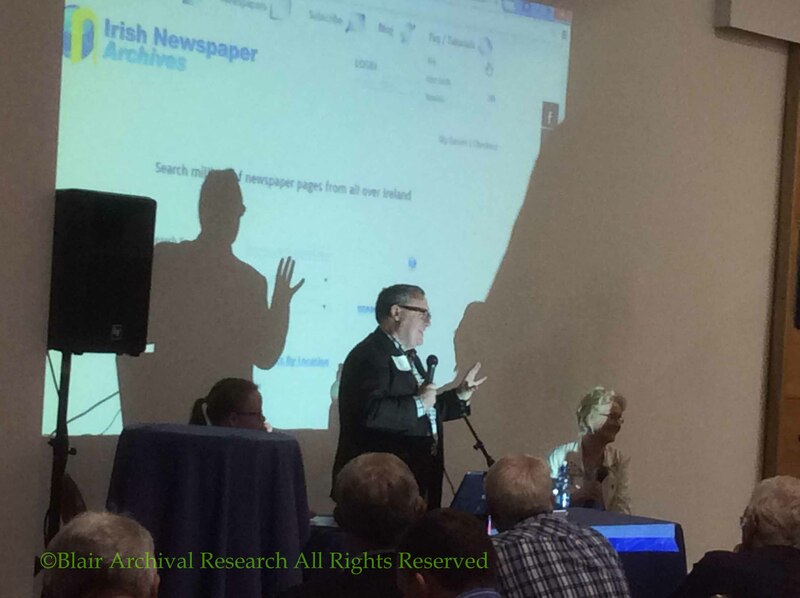 There are professional genealogists who will provide you with suggestions for your research. There is a long list of items for this repository. There are quite a few newspapers I want to check and they have a good selection on microfilm. There are some online but unfortunately not the ones/years I am interested in researching. There are a few manuscripts and books that also need to be checked. Here I will be searching parish registers, newspapers, a few books and manuscripts. I did a search in their online catalogue and came up with a few interesting hits so they need further research. The Valuation Office is a stop on this research trip. There are properties in Dublin and Tipperary I want to check. Fortunately these appear to be digitized and available for the public to view in their offices. I have checked and copies from this office could be expensive, especially with the current exchange rate, so I will have to be choosy about my copies. There are a few birth, marriage and death records that I need to get. I already have my index references so it should be a relatively quick visit to get the copies. The office is located on Werburgh Street and is near St. Werburgh’s Church which I would like to see so I can do both at the same time hopefully. I am going to the RCBL to search some parish registers. I have done research here several times and always find something I wasn’t expecting. They have online lists for some records that they hold. So that is my plan for my research trip to Ireland. It is about 25 pages long and has addresses, opening hours, email, phone numbers, catalogue listings and any other pertinent information listed on it. I will be going through it several more times before I leave. Cleaning it up, adding more information that may be relevant. I always add a little extra so that if I have time it would be nice to find out more.